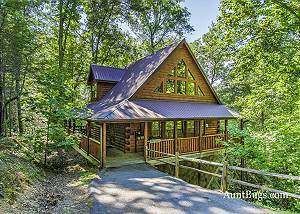 This amazing Smoky Mountain log cabin has two bedrooms on the main floor (great for physically challenged individuals, elderly, or young families).... VIEW NOW. If you were craving some go-kart action but disappointed that the rain spoiled the fun, you are still in luck! The Blake Jones Racing Center features an exciting indoor electric go-kart track where you can enjoy the thrills of racing against your friends and family members! These are the only indoor climate-controlled go karts in the Smoky Mountains and each electric kart offers various speed settings. The best part is that they are eco-friendly so that there are no fumes, no odors and hardly any noise at all! There are single and double go-karts available so as long as you are at least 3 feet tall, you can experience this amazing indoor race track! Another one of the top unique indoor attractions in Pigeon Forge is Pigeon Forge Snow, where you can go snow tubing all year long! As America’s first indoor snow park, this incredible facility offers a whole hillside of snow tubing hills and a huge snow play area where you can build snowmen and snow forts! While it may seem hard to believe, the temperature inside of the building is always between 60 and 70 degrees so you don’t even need to bring your parka along. There are no reservations necessary at Pigeon Forge Snow, so just show up when you are ready to begin your adventure on the slopes! Experience the sensation of flying without the fear of jumping from a plane at Flyaway Indoor Skydiving! This attraction features the first vertical wind tunnel in the country and provides the unique opportunity to break the bonds of gravity and fly! Your adventure begins with a 15 minute class where body control techniques and safety procedures are discussed, then you receive your suit, helmet and other safety equipment. After a brief review of the basics, you will enter the wind tunnel with up to 4 other flyers and take turns flying. Each person receives approximately 3 full minutes of airtime in the tunnel! If you are looking for something a little less extreme that your kids will love, step into the imaginary world of MagiQuest! This is an interactive live-action, role playing game where you will embark on a magical journey through an enchanted fantasy world! The really fun part is that you get to use real magic wands to solve the mysteries of the game! The MagiQuest building is also home to several other indoor attractions for your entertainment, including the Odyssey mirror maze, Vault laser maze and Pirate Golf! Check out all of our Smoky Mountain cabin rentals today to plan your vacation near these unique indoor attractions in Pigeon Forge! We look forward to seeing you soon at Acorn Cabin Rentals!